A couple of months ago, I was introduced to this this Lularoe phenomenon, and have been purchasing patterned dresses and skirts for work (and play). I noticed pretty quickly that I was depending on my one cashmere cardigan whenever I wore anything even slightly fitted to cover those, well, areas I felt would be better covered. So when I was given the opportunity to work with We Are Knitters, I figured this was the perfect time for me to get into the wearables game with this Summer Diamonds Kimono Cardigan, especially since I already dipped my toes in the water with M’s Purple Princess Dress. Now, it was time to make something nice for mommy! I admit I’m pretty clueless when it comes to making clothing because gosh, when have I ever had to think about it. 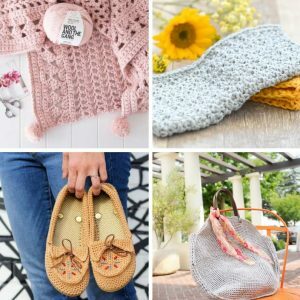 I scrolled through a ton of Google image searches for cardigans and pulled all the characteristics that I liked together to make a cardigan for myself, as a complement to my Lularoe wardrobe. That meant something large and loose, not lacy or flowery, but still having some airiness to it, with a strong collar and border – no petals or shells for me (just not really my style). We Are Knitters provided me with balls of their Khaki Cotton Wool, and what a dream it was to work with! 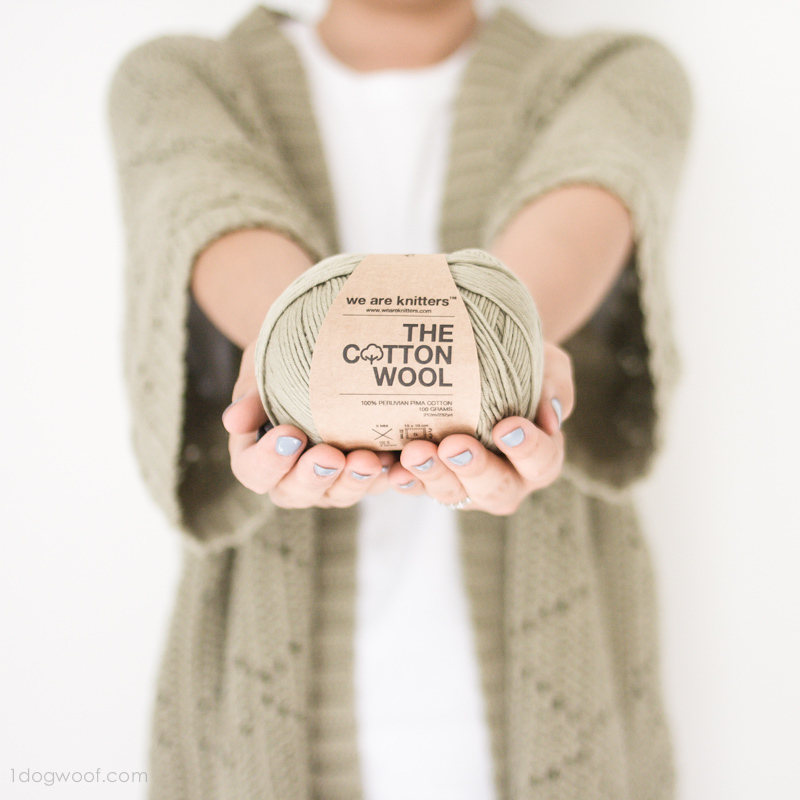 This 100% Pima Cotton yarn is amazing and unlike anything I’ve ever worked with before. It’s definitely different in feel and luxury than the cotton yarn I used for my Jellyfish and other projects! Each Cotton Wool ball is 100g for 212 m (~232 yds), and I used 6 and a half balls for this cardigan. The finished cardigan drapes beautifully, has a nice solid weight to it, yet still feels so light and cool. Could I build the whole body from side to side without ever fastening off? As long as the math worked out and the rows were turned at the right time, it should work. The garment was also all one color, so I could keep connecting balls of yarn to my existing work, which eliminated the hassle of a lot of ends. Was there a motif that would look good sideways? Lakeside Loops’ kimono cardigan reminded me that diamonds are 1. beautiful and 2. will look just as good upright or sideways and 3. look like argyles, which is a favorite pattern of mine, so win win win! Using a simple diamond motif also allowed me focus on the construction of the garment and not on counting complex math sequences. 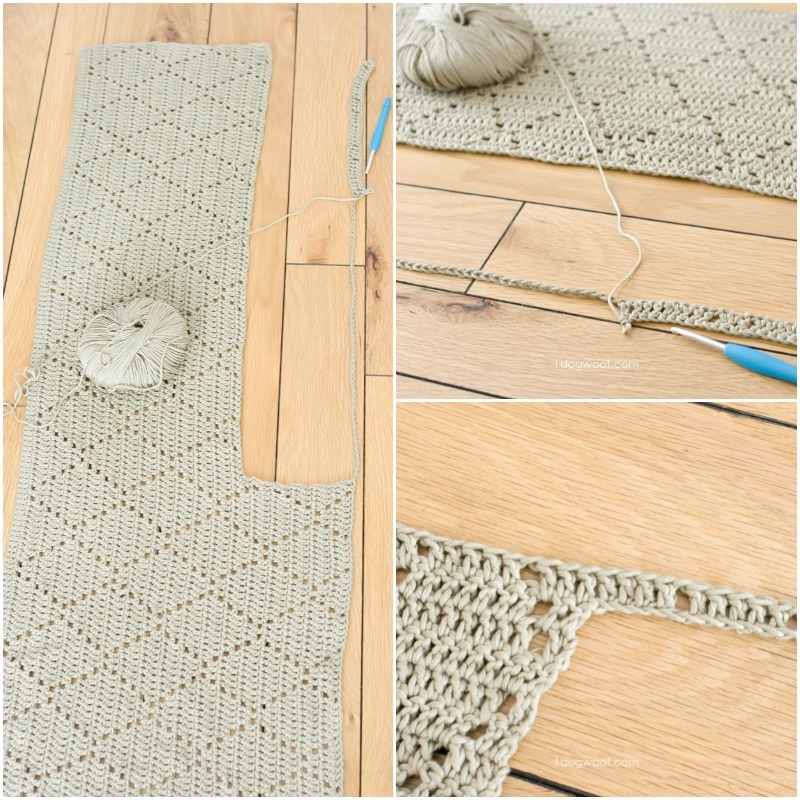 The diamond itself is created by working gaps into sequences of double crochet stitches, but a row needs to have a double crochet stitch at the beginning and a double crochet stitch at the end – you can’t start or end a row on a chain space! It took me a few tries to draw out the repeating motif, and I made a single diamond swatch to see if my math worked out. The widest point of the diamond is 11 stitches, plus the 2 chains, plus the stitch at the beginning and the stitch at the end, equals 15 stitches, but the end stitch also doubles as the start for the next diamond. So, the motif is 14 stitches + 1. My starting chain, or foundation row, needed to be a multiple of 14, plus the extra end stitch. Drawing out several rows of the motif allowed me to check my work and establish a rhythm. Now all I needed to do was figure out when to end the flap, make the back piece, and start a new flap. There was a lot of trying on pieces of crochet in front of the mirror. My husband thought I was crazy. Once the body was finished, I realized I could seam straight up the side and go right into working the sleeve without cutting yarn. Below is a simple diagram showing the basics of the construction. Again, to get the full pattern in the sleeve, I needed a multiple of 14, plus 1 extra stitch. Depending on where that lined up with the rest of the body, I would continue the diamond motif into the sleeve, so it looks like a solid continuing pattern. I admit I got a little crazy when my counts didn’t line up, usually because I had counted to 150 and forgot where I was, or someone talked to me while I was counting (so frustrating!). Using a stitch marker helped a bit. So did counting and recounting and recounting again, forwards, backwards and side to side. Overall, it was worth it though, as everything did end up coming together perfectly aligned and symmetrical! I’ve included several pattern notes before the instructions themselves, so I don’t wander too far off the track later explaining all the little things I worked through. Hopefully these notes can help answer some of your questions. You can also leave a comment so I, or other readers, can help out as well! If you’d like to print this pattern, you can purchase an inexpensive, ad-free and comment-free PDF of the Summer Diamonds Kimono Cardigan at Craftsy (US readers) or Etsy (international readers). The PDF is formatted to include the full pattern and pattern notes, with instructional photos at the end for easy printing. I received a 5mm crochet hook from We Are Knitters. I found that it was closer in size to the 4.5 mm Clover hook than the 5mm Clover hook. Due to the way I was holding my hook for this project (pencil method, instead of my usual knife method), I chose to work with the Clover hook out of comfort. The whole idea of the construction is to create this U-shaped piece, then fold the flaps down – the flaps are the front of your cardigan. Join the flap and the back body together with a seam. The sleeve is crocheted in rows, and then joined with a seam under the arm. The same is repeated on the other side. The chain 2 at the start of rows do not count as stitches. Each chain 1 space created should be treated as 1 stitch. For the pattern, I used both the foundation half double crochet stitch and a foundation double crochet stitch. The body seam leads directly into the sleeves seams. When attaching the trim, make sure to match up the seams on both the trim and the sleeve. The stitch marker is useful to indicate where to join your chain stitches back into the body on Row 38, as well as when you seam up the sides. Use a whip stitch to seam the sleeve and a mattress stitch for all other seams. You can see a video of the mattress stitch here. Here’s a great method of joining yarn, especially when it’s one color. The knots are incredibly small and can be tucked into the stitches almost invisibly. To seam up the second (left) side, attach a ball of yarn using this join method to your beginning tail – now you don’t need to weave in the beginning tail nor attach a standing stitch for the seam! I’ve included the number of rows for the ribbed trim, but that number could change depending on how tightly you sew to the body. What I did, because I didn’t know the final number, was to leave a very long beginning tail, and use the beginning tail to sew onto the body. That way, I could work my ribbing on one end, and sew into the body on the other end, simultaneously. As I sewed, I could see if I needed to crochet more rows of ribbing. Be sure to count your diamonds and stitches as you go! It’s easy to drop a stitch without realizing it. This pattern is sized for me, but it’s pretty generous in size. If you do need to alter the size a bit, remember to start with multiples of 14 + 1. Update: Several readers have asked about sizing and how to alter it for a different size. Here are some recommendations for making adjustments. My garment came out to 30 inches from shoulder to bottom of trim, 29 inches wide when laid out flat, and 53 inches around. I’m 5’8″ and usually wear a size Small (depending on the brand), but this cardigan hangs pretty loose on me, so I’d say this is closer to a Medium in size. For the length – always work in multiples of 14, + 1. Right now, I start with a foundation of 197 stitches = 14 * 14, + 1. 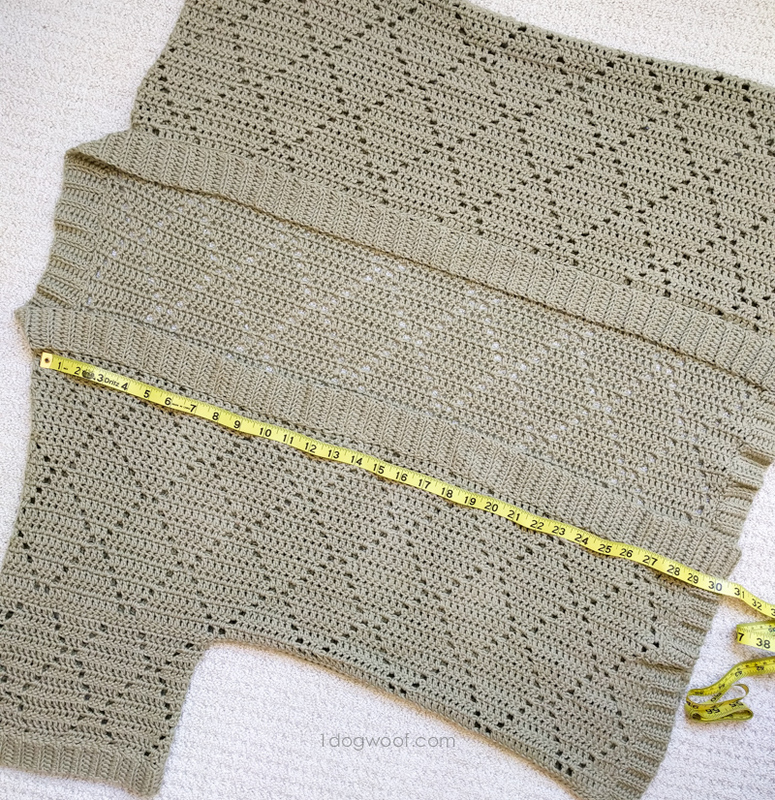 For the width – work the 197 stitches in as many rows as needed to reach desired width of one side of the cardigan. I suggest increasing the original pattern by 2 rows at a time so that you’re still working in the same direction as as the original pattern when it comes time to switch to the back panel. Work the back panel (98 stitches) for as wide as you need the front of your cardigan apart, again adjusting by 2 rows at a time. The other side of the cardigan should be the mirror of the first side. If you always adjust 2 rows at a time, you should be positioned to seam up the side, just as in the original pattern. Seam up however much you’d like, but leave 14x+1 stitches free to work the sleeves. For the sleeve length, work as many rows as needed to reach desired length of sleeve before fastening off. For the trim, create as long a strip of ribbing as you need, using the tips above to create the ribbing and sew to the cardigan as you go. Row 0: Work 197 foundation double crochet stitch. Turn. Rows 11-20: Repeat Rows 1-10. Row 21-23: Repeat Rows 1-3. Rows 34-37: Repeat Rows 24-27. Row 38: Ch 2. Work 1 dc in each of next 3 st. Work [Ch 1, skip 1 st. Work 1 dc in each of next 7 st. Ch 1, skip 1 st. Work 1 dc in each of next 5 st.] 6 times. Ch 1, skip 1 st. Work 1 dc in each of next 7 st. Ch 1, skip 1 st. Work 1 dc in each of next 2 st. Ch 99. Turn. Rows 41-50: Repeat Rows 1-10. Rows 51-60: Repeat Rows 1-10. Row 61: Work 1 dc in each stitch across. Fold the flap down to the line up with the body in order to work the seam. Working through all 4 loops of the double crochet stitches (from Row 61), work 1 sl st in each of next 63 stitches. For the 64th stitch and onwards, work only on one side of the seam (do not join the seam together). This is the beginning of your sleeve. Cut a long tail for working the seam. Fasten a knot to secure the last stitch, then use the tail to sew the seam together, ending at the armpit. Fasten off, and weave in ends. Working through all 4 loops of the double crochet stitches (from Row 61), work 1 sl st in each of next 63 stitches. Row 1: Work 6 foundation half double crochet stitch. Turn. Row 2: Ch 2. Starting from 3rd chain from hook, work 1 hdc in each stitch across, back loops only. Rows 3-44: Repeat Row 2, 42 times, for a total of 44 rows. Join the first and last hdc row by working 6 sl st across. Fasten off, leaving a long tail. Use the tail to join the trim evenly to the sleeve using a mattress stitch. Fasten off and weave in ends. Row 1: Work 6 foundation hdc stitches. Turn. Rows 3-145: Repeat Row 2, 143 times, for a total of 145 rows. Fasten off, leaving a long tail. Use the tail to join the trim evenly to the body’s bottom border using a mattress stitch. Fasten off and weave in ends. Row 1: Work 8 foundation hdc stitches. Turn. Row 2: Ch 2. Starting from 4rd chain from hook, work 1 hdc in each stitch across, back loops only. Rows 3-178: Repeat Row 2, 176 times, for a total of 178 rows. Fasten off, leaving a long tail. Use the tail to join the trim evenly to the body’s collar (up one side, across the back, down the other side) using a mattress stitch. Fasten off and weave in ends. Because I take all my pictures myself, I did a little selfie photo shoot, and had a bit of fun in front of the camera while the kids played downstairs. It was a little bit of silly me time. Our Bay Area weather never gets too hot, and it always cools off considerably in the evenings, so a cardigan like this is perfect for date nights walking around town. I’ve also worn it to work without feeling too fancy in lace or flowers or shells, but just nice enough even over a tshirt and jeans, AND it wards off the crazy air conditioning in the office. If it didn’t take so long for me to finish it, I’d be tempted to make it in other colors, just to use this scrumptious yarn again! 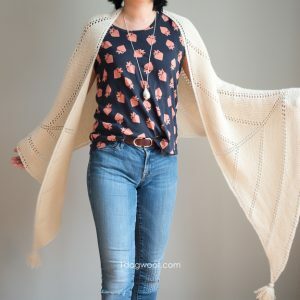 If you make this cardigan, I’d love to see your finished creations! You can share pics with me on Facebook (OneDogWoof) and Instagram (@1dogwoof), where I’ll occasionally re-share your work with everyone. 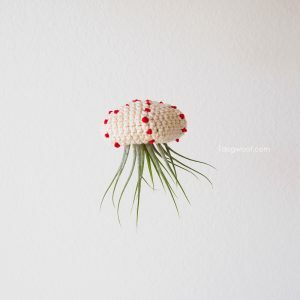 I received product from We Are Knitters for this project and post. The pattern, all notes, instructions, photos and opinions are 100% my own. You are super cute & I love your blog (I am follonig it since a long while now), so thanks a lot for sharing all these nice things with us. Thanks for such a great pattern and the discount. I have ordered both and can’t wait to get started. What size does this fit? Can I increase for a size 2x or 3x? I would like to know this too. It is a beautiful cardigan and I would like to make one for my daughter who is a size 10 and one for myself in a 3x. Hi Carol, to size it up (or down), you’ll need to increase the number of rows worked, since that determines the width of the garment. I would assume the length would not be too different, but if the length needs to change, it always needs to be a multiple of 14, + 1. Then work the number of rows needed to reach the desired width – In order to keep the concept the same, I’d recommend increasing rows in multiples of 2, so that you’re still moving in the same direction as the original pattern. I would say this is a Medium. Sizing it up or down or require redoing the math involved to get the right length (which should be pretty much the same for most people) and more importantly, the number of rows crocheted. To make it bigger, you’d need to crochet more than the listed 61 rows, while always following the same diamond pattern. The construction will remain the same. The pattern is sized for me – I wear a Small, but I’d say this is a Medium. I’ve updated the post with the gauge information – a 4×4 inch swatch is 14 stitches and 9 rows. Hope that helps! Love it and would like to make one for myself. What are the dimensions of the finish project? Can you give us the length of each edge? Thanks! I’ve included a photo which hopefully will help answer your questions. Laid flat, the cardigan is 30 inches from shoulder to bottom trim, 29 inches wide and 53 inches around. Gorgeous! I have been wanting to crochet a kimono all summer, but I haven’t gotten around to it. I love yours! It turned out beautifully! And I have been wanting to try that WAK cotton. Looks great! The ribbing is separate because either the stitches are worked in different directions, or the stitches are of different heights (dc vs hdc). I love the cardigan. But what I cannot understand is how you can go to all that work and not give us, your audience, any idea about size. I would buy this if I could get one to fit me, but there is no way to figure that out. So….I leave very disappointed. I’m sorry you are disappointed. I realized I forgot to include such an important detail, but as I work during the week, I only got the chance to measure and update right now. I’ve updated the post, but I’ll leave the info here as well – a 4×4 inch swatch is 14 stitches and 9 rows, so the sweater is 30 inches long, 29 inches laid flat and 53 inches around. Hope that helps! A beautiful garment both trendy and easy to wear. I’m wondering if it could be done with wool for winter. I love this kimono cardigan and would love to make one for myself and my two daughters. The yarn sounds wonderful but if I intend to make three the cost of each skein is way beyond my budget! Can you suggest another yarn? Thank you for your creativeness. Hi Ann! I think any DK Sport yarn or lightweight Merino would be wonderful choices. Even a worsted weight yarn will work, but it may come out a bit more bulky. I don’t understand row 39 can you help plesse? This is just a full row, which is the other side of the cardigan. It’s the same as all the other full rows. What part are you having problems with? Where it says “joi to the main body after 4th dc” am I to do a foundation row to make up the remaining stitches so it’s back to the 197sstitches? Question on rows 1 and 2. For row 1, it seems the ch2 at the beginning of the row counts as a stitch, I get to the end perfectly following it that way. But for row 2, if I count the ch2 as a stitch. the first space will be directly over the previous ch 2 space. There are 6 dc at the end of row 1, then ch 2 + 5 at the beginning of row 2. Should the ch2 on row count as the first stitch then be followed by ? I counted my 1st ch 2 as a DC since it says Ch 2. Work 1 dc in each of next 6 st. But it Never says how many ch from the hook and I already had a chain of 197. so I ended up with 6DC at the end. I apologize for the confusion. The chain 2 do not count as stitches. I’ve updated the post with a note. Thank you for bringing it to my attention! Hi Nikki! The ch 2 at the beginning of each row does not count as a stitch, and I’ve updated the post to reflect that. I will be updating the PDFs as well. Sorry for the confusion! Hi. I love your art. I am curious. Do you make videos to go with your patterns? I have dislexia and I have a truly hard time getting through a pattern. If you do videos or decide to make videos could you please let me know? Hi Mary, I’m just starting to learn how to do videos, so I hope to provide more in the future! I LOVE this!! You are so talented! I don’t suppose you made the skirt too? It looks crocheted and is GREAT with this cardigan. If you did happen to crochet the skirt, I’d love the pattern! This is my first time crocheting a garment and I find adjusting the pattern to a smaller size challenging in terms of the width. I know you suggested adjusting by 2s. For the body, do I reduce any 2 rows? To maintain a consistent diamond pattern, where do I begin after the reduction? Can you please provide an example? I have completed rows 1 to 23 but realized it may be too big on me. Thanks so much! I am having trouble trying to figure out this same thing! I’m just about to start making this and trying to decide if I want it to be huge on me or try and reduce the width. I bought this pattern at Craftsy and have bought the yarn from WAK. I am almost an intermediate crocheter. My question is what stitch is used to make the swatch? You may have mentioned it or it’s self evident but I do not see it. Thank you. The pattern is gorgeous and I am very anxious to start it. For the swatch, I use the same stitch as in the pattern, but make enough to cover the 4×4 inches to check gauge. You can see an example here: https://www.instagram.com/p/BGppW-IKi4m/?taken-by=1dogwoof. Thanks! That’s so great to hear, and glad you’re enjoying your cardigan! I also do not understand row 39 where it says join to body. Can you explain how to do that part specifically? Thanks! This question was asked before, but I couldn’t find the answer. Sorry if you posted this and I missed it! You are so talented and I love your work. I’m looking forward to making this sweater. How would you classify the level of difficulty of this project? This is absolutely adorable. I love it. I’ve been crocheting for 45 years but have NEVER been brave enough to try clothing until now. This looks doable, I’m going to give it a try. Thank you for all your work and pattern making skill sharing. THANK YOU! I too have been bitten by the LuLaRoe bug, and have been looking for something fun to throw on top of my usual skirt-n-shirt combo. Can’t wait to work this up! Hi. 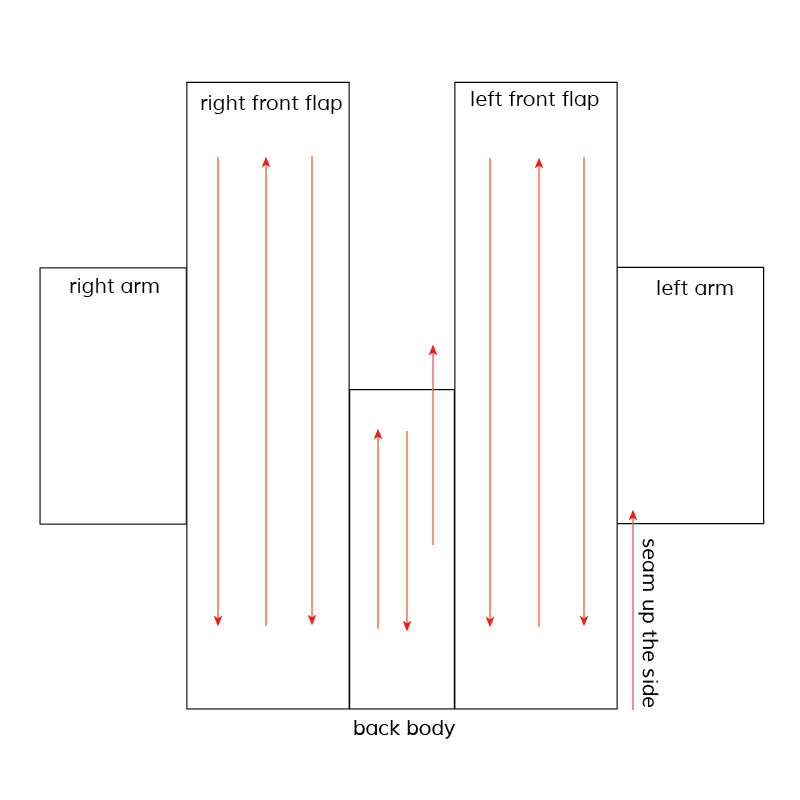 I have a question on the “left seam and sleeve” section. The instructions say to work through all 4 loops of the double crochet st from Row 61. My left seam is on Row 0 and doesn’t have the 4 loops referred to in the instructions, so I’m a little confused. Am I seaming in the right place? Do I use the same slip stitch method as the right seam and sleeve (which I have already completed)? I’m so close to completing my first crochet project since I was in sixth grade! (a loooong time ago). I hate the thought that I messed up somewhere along the line. Thanks for sharing this beautiful pattern. Hi Susan, you want to fold the cardigan down and seam it. 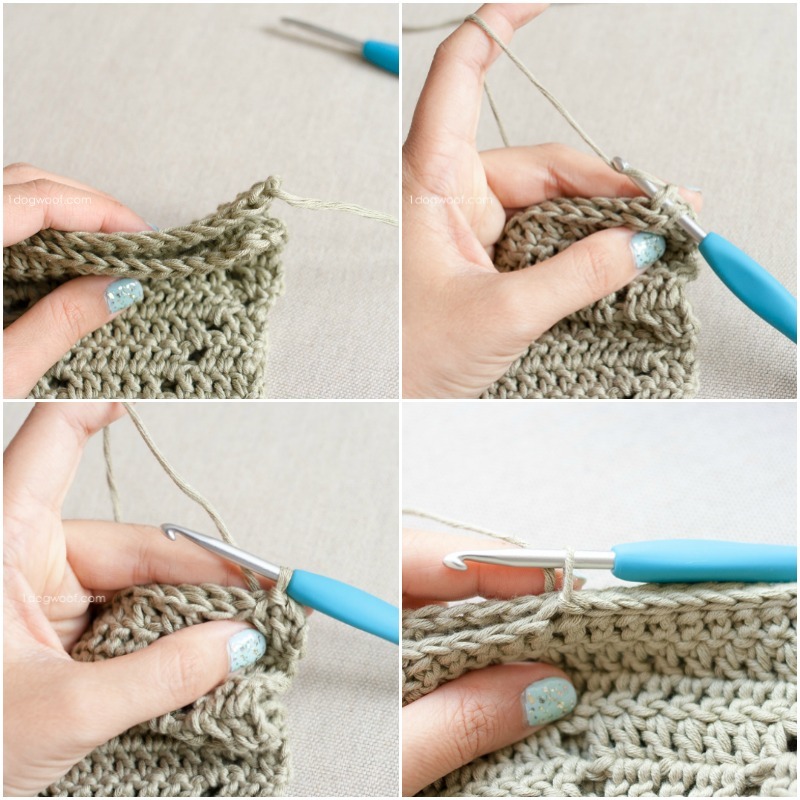 You should get 4 loops when you fold the piece in half, so that you’re working through 2 pieces of crochet. The left and right seams should be the same. Hope that helps! Thanks for replying so quickly. Yes.. I seamed the right side and worked the right sleeve with no issues. So for the left seam I have to start with a new thread? The bottom of my left seam is at the beginning foundation stitches of Row 0. There are only two loops to sew through. Maybe I did the initial fold incorrectly? I love all the extra pictures illustrating so much of the pattern. Thanks ! Hi Erica, the notes in the post give some direction on how to do the math to increase to larger sizes. I’m sorry I don’t have all the math already worked out for this design. Foundation double crochets are easy to increase, since you just keep working the same stitch until you get the length you want. Thanks so much for the pattern, it’s beautiful and very easy to follow. On collar trim, row 2, why do you start on 4th chain from hook, instead of 3rd one, like on the other trims? If you are all the way to the trim could you please explain row 39 where it says to join to the body ? Several have asked this question & haven’t gotten an answer ! Please & thank you ! Row 39 is the same as Row 9. Once you’ve made the chains to get you back to 197 sts, you’ll work the row just like any other full row. I tried to clarify that somewhere in the middle is where you’ll make the transition from the front of the cardigan to the back of the cardigan, but as it seems to confuse people, I’ve simplified the post to show that Row 39 is really just a repeat of Row 9 in the diamond pattern. I hope that helps! I’m guessing it’s a typo, and I’ll have to take a look! Thanks! All is going fine until Row 39. Looking at the photos, it looks like the Row 39 stitches are worked in the 99 chains at the end of Row 38? But then I get confused about: Work 1 dc in each of next 7 st. (Join to the main body after the 4th dc).?? Hi Joyce, yes, Row 39 is worked into the 99 chains at the end of Row 38, and the stitch pattern is the same as Row 9. You’ll work the row just like any other full row. I didn’t realize that the extra note about joining to the main body would be confusing, and I’ve removed that statement. You should work Row 39 just like Row 9, as if the chain stitches were the previous row. I hope that helps! The Second Panel: I assume I follow same as First panel? Thanks much. Love your pattern. Hi and how are you? 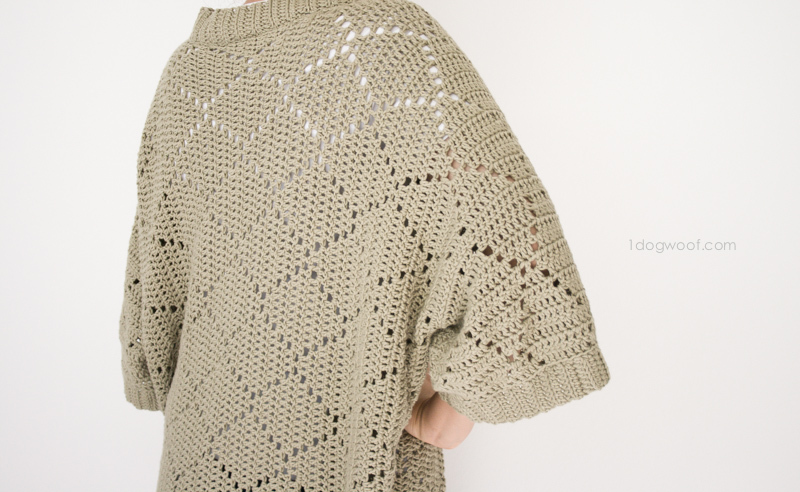 By any chance have you considered making a video of this summer diamonds kimono cardigan from start to finish? It is a lovely cardigan. If so please inform me. As I am allergic to wool and don’t want to use cotton, can u suggest a substitute acrylic yarn plus weight to use for this beautiful kimono? I am so anxious to make it. Thank u. Please please explain row 39!! I can’t keep going with your beautiful pattern until you do :(. Thank you!! Great! Thank you. I shall try to do it myself. Question: the skirt you’re wearing in the pictures you’ve made it yoursefl? As several have ask about row 39 & still haven’t gotten a reply I’m stuck & needing to finish this for my Mom’s birthday! Could you please explain how you join to the body? Thank you !